"Come along, no more stops, we need to find our way to Solitude." "When we get back to Cyrodiil, I swear I will hire an army of battlemages to come up here and set fire to the whole damned province." 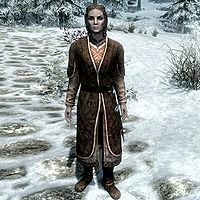 Salonia Carvain is a snobbish Imperial citizen who traveled all the way from Cyrodiil to participate in the wedding between Vittoria Vici and Asgeir Snow-Shod. She can be randomly encountered twice in the wilderness, before and after the quest Bound Until Death is completed. She travels on foot accompanied by her husband Plautis and a single bodyguard. 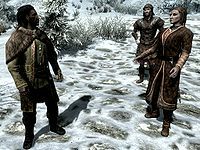 Due to their lack of knowledge about Skyrim, the group never makes it to the wedding in Solitude; instead they will end up inside the Temple of Talos in Windhelm, a long way from their destination. When first encountered, Salonia's attire reflects her upper-class status and attitude, with fine clothes and matching boots. She carries a steel dagger and a selection of valuable gifts meant for the bride to be. Salonia: "I hate it here. Those were my favorite shoes, ruined and for what? We never even made it to the wedding." Plautis: "Wha... Your shoes? We get robbed by bandits, my clothes torn to shreds by some giant cat, our bodyguard eaten by a dragon... And you're worried about your shoes?" 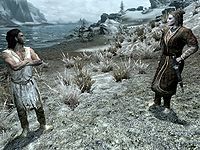 Salonia: "When we get back to Cyrodiil, I swear I will hire an army of battlemages to come up here and set fire to the whole damned province." This page was last modified on 24 December 2013, at 21:35.